The 23rd UN climate conference: Everyone is in agreement, but nothing changes. 23 times. That's how often the UN has held its annual climate conference in an attempt to prevent dangerous global warming. You undoubtedly know of the conferences in Kyoto and Paris, but there are probably few people who can remember the other 21 meetings. And that isn't strange either, because often it's all talk and little action. 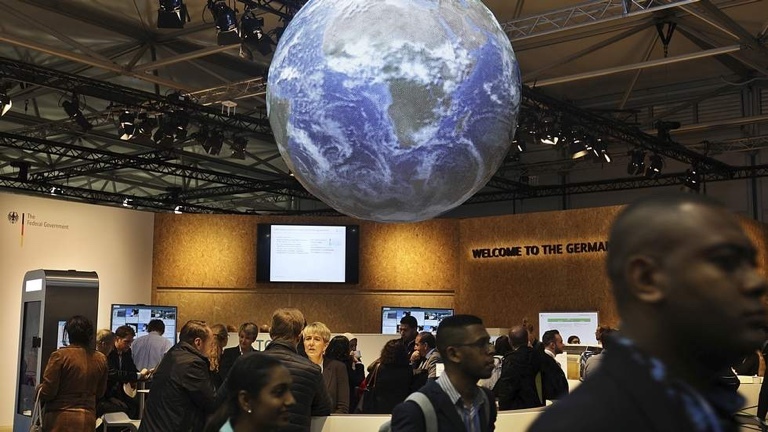 Expectations for the 23rd edition that will be held in Bonn this and next week, now that Trump has stepped out of the Paris Agreement, are low. If nothing goes wrong, it will already be a success. But wasn't the climate saved already? Didn't we agree in Paris that the earth should not warm up by more than 2 degrees, preferably just 1.5 degrees? Yes, but the Paris Agreement is a pragmatic treaty in which countries can decide themselves how much they reduce. There are no obligations. With the current commitments, we are on our way to a dangerous global warming of 3 degrees. The upcoming UN climate conferences must therefore ensure that countries will take stronger measures. A recent report from the World Meteorological Organization (WMO) showed that things are terribly wrong: the amount of CO2 in the atmosphere never before increased as fast as last year, to a record high. In order to avoid dangerous climate change, emissions have to drop quickly. Perhaps even faster than they went up. Politicians like to pride themselves by talking a lot about climate change, but reality leaves much to be desired. For example, the new Dutch government presented a very ambitious climate policy, but an independent calculation showed that they can not live up to half of it. Closing the gas tap of Europe's largest gas field is also not on the table in the Netherlands, despite a series of earthquakes. And while the Canadian Prime Minister Justin Trudeau likes to appear greener than his conservative predecessor, who stepped out of the Kyoto Protocol, this left-wing politician also gave permission for more oil drilling and emissions are still not decreasing. But the hypocrisy can get even worse. The governor of Alaska, Bill Walker, recently announced that he wants to meet the goals of the Paris Agreement. A clear message from an arctic state where temperatures rise twice as fast as in the rest of the world. The permafrost covering large parts of the state is thawing because of this, which is most apparent in the coastal village of Shishmaref. Because the sea ice is melting away and the ground is thawing, strong waves driven by winter storms erode the coastline by so much that, one by one, houses start to fall into the sea. The cost of moving the 500+ inhabitants to the mainland is estimated at more than one hundred million dollars. Besides Shismaref, there are many other villages that await the same fate. Meeting in Bonn: the UN will hold its climate conference in Germany this and next week. But in the same week that the governor from America's most northerly state sounded the alarm about climate change, he also tuned to a very different song: he wants to drill for more oil. In the middle of the Arctic National Wilderness Refuge. A nature reserve in the northeast of Alaska, larger than Spitsbergen. The oil yield should then be used to counter the effects of climate change. An ethical split and a classic example of the Norwegian proverb "to pee in your pants to stay warm". Despite resistance by the indigenous population, this is politically uncontroversial in Alaska. For decades, local politicians have been trying to allow oil drilling in what is the largest nature reserve in the US. But that has nothing to do with climate and everything with the economy: the oil industry itself claims to be responsible for a third of the employment in the state, and for more than 85% of its income. Does that sound familiar? Yes, you can say that Alaska is an extreme mirror image of the situation in Norway. There too, the government prefers to drill for more oil than to prepare the economy for an oil-free future and to stop its contribution to climate change. If the legislative and executive powers abandon their task of protecting us against climate change, but do the opposite, only one government branch remains from which we can hope it will assume its responsibility: the judicial power. The trial by Greenpeace and Natur og Ungdom (Nature and Youth) against the government's decision to allow oil drilling in the Barents Sea will start next week in Oslo. The drilling for oil may be what provoked this lawsuit, but what is ultimately at stake here is nothing less than our collective right to a future without dangerous climate change.